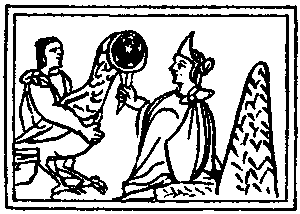 Moctezuma views a magic mirror that foretells that coming of the Spaniards. Was the emperor really ruled by superstition, or was he more practical? Moctezuma II, the 9th emperor of the Aztecs, was known as Motecuhzoma Xocoyotzin. Today his name has a lot of spellings, including Montezuma and Motecuhzoma. Modern scholars sometimes call him Moctezuma II to differentiate him from the other emperor of the name, but in his time the number was not used. The name signifies frowning and kingly anger. He was Heuy Tlatoani Moctezuma, the Great Speaker of the city of Tenochtitlán (read more about the titles of Aztec government). He was born around 1466, and was to become a successful ruler and general even before he became emperor from 1502-1520. It was in 1517 that the emperor first got the news that strangers had landed on the coast. On the 8th of November 1519, Cortes and Moctezuma met. Over the next few months, he was used and imprisoned by the Spanish as the conquest progressed. He died in 1520 during a battle with the Spanish, though the exact cause of his death is a matter of disagreement. Actually, that's not the only thing that's a matter of disagreement. Just about every aspect of Moctezuma II has been open to controversy. The problem is that sources are highly contradictory. Somebody was rewriting history, or maybe everybody was. The Spanish were no doubt anxious to justify the conquest of the empire. The indigenous peoples themselves may have wanted someone to blame as well. For this reason, it's hard to get beyond the basics and really understand the man. In many ways, this emperor is believed to have been harsh in the ruling of his empire. This may be the reason why Cortes was able to find allies among the cities of Mexico in his conquest. Many may have been happy for the chance to free themselves from the powerful Aztecs. But was it Moctezuma II that was really the target of this hate, or just the powerful Mexica culture? When it came to conquering and expansion, it was really the previous emperor that steals the spotlight - Ahuitzotl. The empire went through stages of expansion, and Ahuitzotl was the emperor in charge of the most recent one. He more than doubled the area of dominance. One of the great generals that fought his battles, however, was his nephew - Moctezuma. When he came to power after Ahuitzotl's death, it was natural that his job should be to consolidate the power that had come so recently to the Aztecs. He strengthened the reign of himself and his nobles, though his conquests were not as widespread as the ruler before him. Evidence seems to be mounting that Moctezuma II was actually an industrious and clever ruler. It may be that he has been misjudged from his encounter and loss to the Spanish as indecisive, superstitious and capitulating. He ruled an empire of 5-6 million people. Would that empire have continued a thousand years? Or was it already about to be torn apart by civil war? Either way, many today suggest that he accomplished a lot in the building and maintaining of the empire, until its fall. 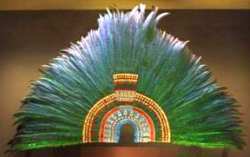 Moctezuma's headdress, probably worn when he met Cortés. Originally a helmet of gold topped with 400 feathers, Cortés has the gold melted and the head piece sent to Charles V of Spain. See a larger photo of Montezuma's headdress (click the images). You can read about the fall of the empire elsewhere. What hand Moctezuma II had in that fall may never be known. He was certainly faced with a difficult situation when the powerful strangers landed. He chose eventually to meet them in peace, giving gifts and even allowing for their lack of cultural knowledge (for example, no one was allowed to look directly at the emperor - Moctezuma apparently overlooked Cortes' offense in this matter). The Spanish in reality may have just provided the excuse needed for an inevitable civil war. The Europeans did not conquer the empire alone, they were only a part of a force that changed the order of things in Mexico. The belief that the Aztecs took the Spanish for gods is coming more more into question. The people were religious, but not uneducated. It is questionable whether it was the superstition of the emperor that was his downfall or not. No one is sure how he died. He may have been killed by the Spanish when they felt he was no longer useful. Other sources claim he was killed by his own people, who felt he had lost them the empire. He probably died disgraced in June 1520. Moctezuma II was succeeded by his brother Cuitláhuac, then by his nephew Cuauhtémoc, the last of the Aztec emperors.